"I’m on the hunt for who I’ve not yet become." "It only takes one person to change your life: You." "Sometimes when you’re in a dark place you think you’ve been buried, but you’ve actually been planted." "One reason people resist change is because they focus on what they have to give up, instead of what they have to gain." "As your life changes so will your circle." "The best apology is changed behavior." "One day, you realize that there are some people you’ll never see again. At least, not in the same way." "Trouble is inevitable, but misery is optional." "Stay in the game. Live your life like you have a piece of steel in your back bone. Anybody can sit on the sidelines." "God is especially pleased with those that keep faith and move forward quietly regardless of their struggle." "Refuse to dwell on past failures or disappointments. Find strength in adversity." "Focus on what God has in store for your life." "Any one person's version of the truth is complicated, usually ambiguous, and always contestable." "We were built to overlearn from negative experiences, but under learn from positive ones. But with practice you can learn to disrupt and tame negative cycles." "Life is tough, but it's tougher if you’re stupid. You have to learn from yesterday." "It isn’t the mountains ahead to climb that wear you out; it's the pebble in your shoe." "Negative words bring negative results." "Remember that your perception of the world is a reflection of your state of consciousness." "Love your enemies means have no enemies. Drop all negativity and resistance." "Acceptance of the unacceptable is the greatest form of grace in this world." "Love does not want or fear anything." "When you allow each person to be as they are, they begin to change." "Of course I will be afraid. To pursue my dreams I may lose everything I have won." "The greatest thing a person can do is to contribute to the well being of another." "When you lose your joy, you lose your strength." "Don't compare. When you compare, something or someone gets diminished. Jesus said "let not your hearts be troubled""
"Don't pray for others to change. Pray for the change in yourself." "If God removed some of the challenges in your life right now, you would not be prepared for what He has in store." "Knowledge of yourself produces humility, and knowledge of God produces love." "When the ego weeps for what it has lost, the spirit rejoices for what it has found." "The door to wisdom is knowing yourself." "Life is happening for you, not to you." "The hardest moments are a calling to something greater." "Wealth, notoriety, place and power are no measure of success whatever. The only true measure of success is the ratio between what we might have done and what we might have been on the one hand, and the thing we have made of ourselves on the other." ARE YOU AS HAPPY AND SUCCESSFUL AS YOU WANT TO BE? If you’re like too many people, the answer is no. You’ve conditioned yourself to pretend to be happy. When you meet someone who is a total stranger and they ask how you are, what do you say? “Fine,” right? Really? The truth is, your relationships with family, friends, work, money, and self-esteem aren’t what they should be. It feels like you’re going through the motions. That sparkle, that shine, that childlike joy you long to feel eludes you. Instead of being energized by purpose, you drag through the day wondering, Why don’t I feel happier? It doesn’t have to be this way. You can create a life in which you thrive, not just survive. 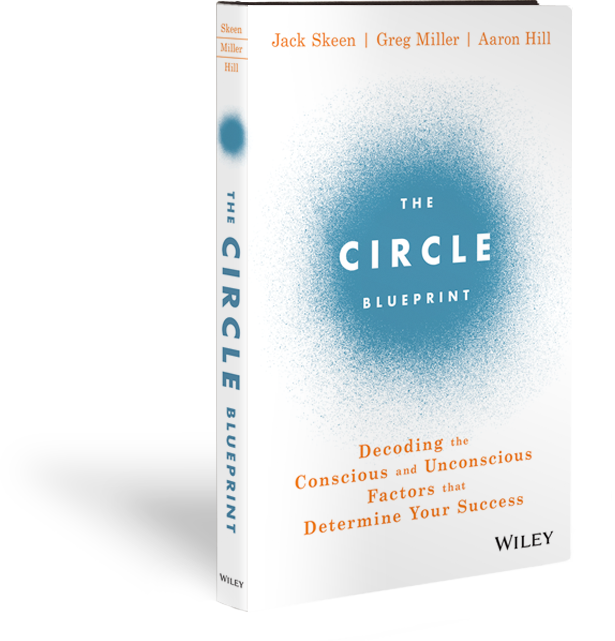 The Circle Blueprint by Jack Skeen, Greg Miller, and Aaron Hill—in conjunction with a scientifically validated psychometric self-assessment and a series of supplemental workbooks—helps you dig to the root of the problem and break the conscious and unconscious habits and patterns that hold you hostage to a life that isn’t working for you. It cuts through the noise and forces you to be honest about the changes you need to make. Your Circle is a map of the choices you make every day—choices that shape the quality, satisfaction, and impact of your life. The good news is your Circle can be adjusted—expanded, narrowed, and balanced—to steer your life where you want it to go. You can define your Circle, master it, and create the life you want to live. 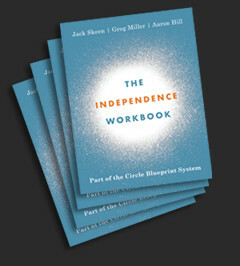 The Circle Blueprint System is simple, doable, and incredibly thought-provoking. Best of all, it’s not about starting a whole new life; it’s about reshaping the one you have to keep what’s working and adjust what’s holding you back. An “okay” life isn’t good enough. It is your right to wake up every day saying, “Wow, my life is amazing!” Discover what it takes to radiate joy, power, and peace every moment of every day for the rest of your life. You have only one life and you don’t get your money back if it goes poorly. It is your right to thrive.